Tetra Pak , one of the world's leading suppliers of food and beverage processing and packaging systems, has demonstrated its continued innovation in packaging with the introduction of the Tetra Wedge Aseptic Clear, the world's first high barrier, totally clear aseptic package. In May, Mexican beverage company Jumex rolled out Nautix, the first commercial brand in Tetra Wedge Aseptic Clear, into the Mexican market. Tetra Wedge Aseptic Clear provides consumers with benefits including 100% transparency to see the product, a patented barrier technology to protect the product, and aseptic processing which seals in taste and nutrition. "The initial response in Mexico to this new product, distributed initially through Wal-Mart(R), has been great," said Jeff Kellar, vice president of strategic business development at Tetra Pak. "And, the initial response from consumers surveyed in the U.S. has been equally promising, with the most common reaction among kids being 'Wow! I've never seen anything like this.'" The next step is to take this new technology to the United States through brands looking for a distinct advantage in the competitive beverage category. "The demand for healthy beverages is increasing and Tetra Wedge Aseptic Clear can help fulfill that demand in an innovative new package," said Vanessa Solmaz, business development manager at Tetra Pak. The Tetra Wedge Aseptic Clear allows for both high- and low-acid applications, making pouch-style, shelf-stable packaging a new possibility for the dairy and soy industries. Aseptic processing opens up new formulation potential not currently possible through hot-fill processing. 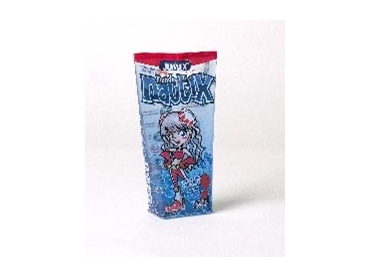 In addition, the size and shape of the package makes it ideal for kid beverages. Ergonomically, the Tetra Wedge Aseptic Clear was designed with smooth sides and no sharp edges like current commercial stand-up pouches and its slim 6.75 ounce design allows small hands to easily handle the product. Retailers will see great benefit in the package as well. The aseptic technology allows for distribution advantages and a long shelf life without the need for refrigeration, all the while retaining the nutritional value and flavor profile of the product. The durability of the package provides several differentiating benefits to consumers. To facilitate easy straw insertion, the package is designed with a special straw hole pocket that guides the straw to the best position to puncture the straw-hole patch. The strength of the package material prevents the straw from puncturing the opposing side of the package, a common problem with existing pouches. The Tetra Pak package is 80% more puncture resistant than other stand-up-pouches. Environmentally, Tetra Wedge Aseptic Clear is a best in class source-reduced package versus other pouches, bottles and cans. Operationally, Tetra Wedge Aseptic Clear offers reduced energy and water consumption versus hot-fill. This process also eliminates labor and additional steps required with pre-made pouches.